British Anchor Pottery Co. Ltd. Originally specialising in Earthenwares, the company continues to produce pottery with a short break between 1940 - 45. 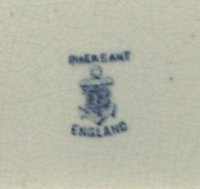 Used the "Asiatic Pheasants" pattern during the period 1884 - 1913 and possibly later. Took over the works from John Thomas Hudden who also produced "Asiatic Pheasants"